The thoracic outlet is the gap between the clavicle (collarbone) and the first rib. There are lots of nerves and blood vessels which run through this space, including the brachial plexus and subclavian artery and vein. If the posture around the shoulder is not good, then the shoulder moves forwards, which lowers the collarbone. This can result in compression of the nerves and blood vessels underneath it. Similarly, tension in the scalene muscles can cause compression. 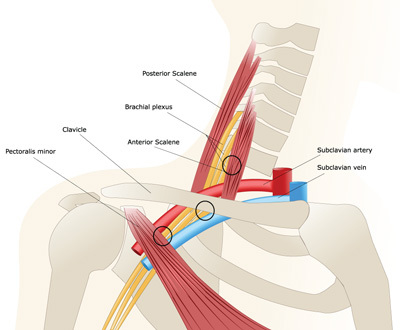 Congenital anatomical variances (meaning genetic body types and traits inherited from parents) can also make it more likely an individual will developing thoracic outlet syndrome. For example, cervical ribs and collarbone abnormalities. Traumatic injuries to the clavicle such as fractured collarbone may also reduce the space, especially in cases of malunion. Stretching the chest muscles especially pectoralis minor and scalenes can be beneficial in improving posture of the upper back and shoulder girdle. Stand in a doorway or next to a wall. Bend the arm being stretched and place the forearm flat against the wall or doorframe. Step forwards and rotate your body away from your outstretched arm. Hold for between 10 and 30 seconds. Sports massage – particularly trigger point therapy. Trigger points are tight localized knots or lumps in the muscles which cause back pain. Treatment is often part of a deep tissue massage and involves applying sustained pressure to the trigger point in the muscle. As pain eases the pressure is increased again without easing off. This is repeated two or three times as appropriate. Play upper back massage video.